Nestled on the north coast of New South Wales and serving as the main town on Cape Byron, the holiday hub of Byron Bay occupies Australia's most easterly point. It is a haven of unspoilt beaches, laid-back pursuits, some quirky locals and a spiritual atmosphere which is making it burgeon as a desirable holiday resort. One of the greatest attractions of Byron Bay is that it's the best place on the Australian coast for land-based whale watching (between June and September). The Cape Byron walking trail offers views of dolphins playing in the waves, and humpback whales breaching as they migrate to the north. It is also undoubtedly paradise for those into adventurous outdoor activities, from skydiving to surfing. The magnificent scenery, the proximity to the rainforest, and the various nature reserves and sanctuaries make it a sought-after holiday destination for eco-tourists. 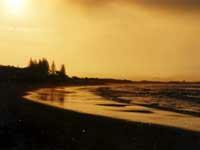 Culturally, Byron Bay prides itself in being 'alternative', boasting a number of spiritual retreats and health spas. Annual events like the International East Coast Blues & Roots Music Festival at Easter, and the Byron Bay Writers' Festival in August, also draw the holiday crowds. Byron Bay can certainly be said to offer something for everyone, all year round.